Removal ProcedureRelieve the low and high side fuel system pressure. Refer toFuel Pressure Relief.Remove thermostat housing. Refer toEngine Coolant Thermostat Replacement. Use the EN-48896 alignment gaugeto ensure that the camshaft lobe is in the base circle position. At base circle thetool will be flush with the head.Lubricate the high pressure fuel pump cylinder head bore and roller lifter with camshaftprelube. Refer toAdhesives, Fluids, Lubricants, and Sealers. Note:The high pressure fuel pump gasket has a retaining feature to hold the pump retainingbolts in place. 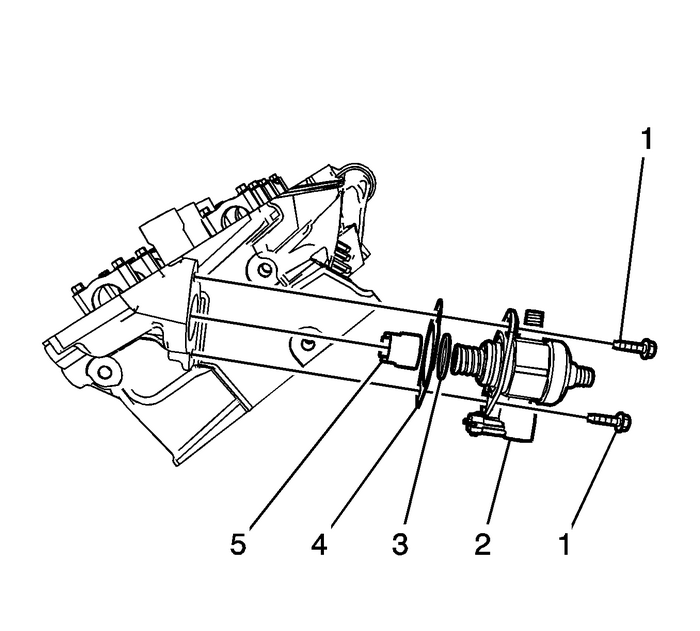 Install the high pressure fuel pump roller lifter-(5).Install a NEW high pressure fuel pump O-ring-(3).Position the NEW high pressure fuel pump gasket-(4) and bolts-(1) to the fuel pump.Install the high pressure fuel pump-(2). Force will be required while hand tighteningthe bolts. Tighten the high pressure fuel pump retaining bolts to 15-Y (11-lb-ft).Ensure the high pressure fuel pump and fuel rail fittings are clean prior to assembly.Install a NEW high pressure fuel pipe. Refer toFuel Feed Intermediate Pipe Replacement.Install a NEW fuel feed pipe to the high pressure fuel pump. Refer toFuel Feed Pipe Replacement.Connect the high pressure fuel pump wiring harness.Install the thermostat housing. Refer toEngine Coolant Thermostat Replacement.Install the fuel tank cap. Note:If a fuel leak occurs at the fuel rail, the fuel rail will need to be replaced. Inspect for leaks using the following procedure:Turn ON the ignition, with the engine OFF for 2-seconds.Turn OFF the ignition, for 10-seconds.Turn ON the ignition, with the engine OFF.Inspect for fuel leaks.Install the pressure relief cap to the fuel feed pipe.